why muslim Malians don't have a writing system when a little community in Niger has one and the same for a non-muslim society in Sierra Leone and Liberia? So, Portugal started buying slaves in '500, some of them knew Bassa Vah. It has nothing to do with Arab writings, because Arab don't even have vowels and is completely different in structure. I'm aware further researches must to be done, but linking all of them to mythological "Arabs" is silly and simplistic. North Africans use Arab script, don't they? They speak an Afroasiatic language, and most are genetically closer to Arabs than to anyone else. Now, I am not denying Subsaharan Africans adapted the alphabet that came from Muslim and European sources in recent times. What I am saying is that those events are not "ancient" since they come at the most from the late Middle Ages and the early Modern times. Writing is recent in Subsaharan Africa, and was mostly analphabet up to the middle of the twentieth century, and still today around half of the population don't read. Now there are the Europeans too? 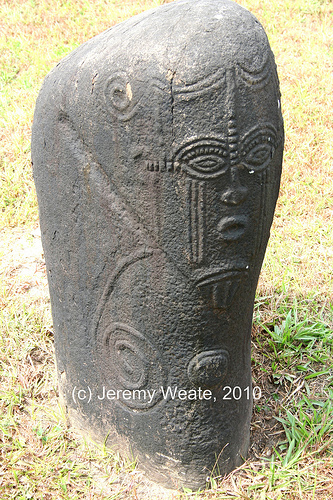 Even a slave of Clabar knew Nsibidi, even a slave of Sierra Leone knew Bassa Vah, it's part of their history and it can't be erased. Bassa Vah, Nsibidi and that script used in southern Niger (and Meroitic and Ge'ez) have nothing to do with Arab writing, Arab alphabet or any Latin script. If for you Amazighs are Arabs, well, this say more about your ignorance on African populations than about Amazigh history and traditions. You discovered who an Hausa is some days ago, but 4 minutes made you the greater expert. Those writing scripts haven't the structure of Arab, don't even look like Arab and I do not pronounce on Latin script, because that sentence is hilarious. Eritreans and Ethipians use the Ge'ez script. What I can perceive is yours Afrocentrism. And I do know Berbers like Amazigh are Afroasiatic peoples, related to Arabs, and not black Africans. I know as well that Ethiopians have been influenced from Afroasiatic peoples since early civilizations. And obviously, "calabar" architecture above is British . Whatever. Believe what you want. Subsaharan Africa is not precisely my favorite historical region of the world, and you can invent anything that please you. No, I choose the only pic of pre-colonial Calabar now avaible. I'm not African American or Afrocentric, and I don't try to claim half the world, since I'm African and I know the history of my country. Unfortunately for you i know Ethiopians and Amazighs in a non-American ambianent, and they consider themself Aricans. Romans built Rome, but Vikings that built huts were Eruopeans too. If you are ignorant about pre-colonial Africa this is not the right forum to add info about it, too many racists. Ah, and maybe you'll try to say me even nsibidi come from a contact with other people. 1. I have been here for more than a year, and I can clearly say that pinguin is NOT racist. I do not see why you believe he is. 2. CALM DOWN! This forum is not meant for people yell at each other and label each other racists simply because they disagree. I quit the thread. First, claiming that every slave read and write is simply a fantasy, given the fact that even in the 80s most of Subsaharan Africans were analphabets. How to expect that ancient tribal peoples knew writing is amazing. And, in second place, it is quite pathetic that certain Africans are proud of theirs slaves, when African slave-traders sold innocent people like cargo to foreign lands, just for profits, in exchange of rum, textiles and rifles. If in further posts there is evidence of ancient writing, supported by dates and reliable sources, I'll came back to congratulate. Otherwise, this thread bored me, given the fact it sounds just as propaganda. You are assuming SSAfricans are all the same, when only a part of the slave population was Bassa or southeastern Nigerian and knew their respective script. Did you see the gravestone or you are blind to it? ...given the fact that even in the 80s most of Subsaharan Africans were analphabets. How to expect that ancient tribal peoples knew writing is amazing. Again, we are not ALL THE SAME! Only Bassa and southeastern Nigerians (Igbo and other people) knew writing (and that group of Nigeriens and Horners). We Sub Saharan people don't are all the same, for example do you know I'm not carrying a bone in the middle of the nose now? And the same was for my great-grandfather. And, in second place, it is quite pathetic that certain Africans are proud of theirs slaves, when African slave-traders sold innocent people like cargo to foreign lands, just for profits, in exchange of rum, textiles and rifles. Yes, come to me (knowing personally people whose compatriots were kidnapped in old times) saying the "all Africans were sold" misinformation. This can be good for you, but it's not the reality and I'll don't discuss here the matter (kidnapping people with short swords and spears is really easy with the help of a gun, and since they are not even human you are only haunting a beast). However, this was for a part (not everyone) of Igbos, for Bassa I'm not informed about their old structure (you don't simply turn the road and find a person from Sierra Leone). Yorubas can be proud to have orisha worshippers in South America and Sierra Leoneans to have reconstructed a part of their heritage. If you want to know how nowadays are viewed those chiefs that sold their war prisoners, well, they are viewed as "enemies of Africa", "allies of the Colonialists", and "inherently not Africans". The matter is different for Swahili people of the coast (their culture is maintained strong), where having a slave ancestor is not so honorable. Well, I can agree more than those chiefs that sold people are as guilty of that inhuman trade like the Europeans that bought them. Besides, you haven't get my point at all. I know the cultures of Africa, both Northern Africans and Subsaharans. And obviously, unlike in the African countries of the Mediterranean Sea and the North East part of Africa, like Egypt and Ethiopia, writing was not widespread in the south and West South, and at least was not introduced in very ancient times but during the middle ages and modern times. That's not something to be ashamed at all (the barbarians, the Mongolians, most Native Americans, Australians, Inuits and Polynesians were analphabets as well, for instance, and doesn't means theirs culture is worthless at all). What matters is not confusing writing with symbolic systems. Most human beings have known symbols since hundred of thousand of years ago, but writing is a recent invention, and alphabets are even newer, and dated to around 3 thousand years ago at the Middle East. Are your patronizing me? Hilarious. And again, I'm not trying to splat all these script as simply Africans, because WE ARE NOT ALL THE SAME. Here we're talking about a small group of Hausas and pre-colonial Bassas. However, people were trading goods for thousands of years (pottery found in Mali dating 9400BC <source>), they might have been in contact with Amazigh script or early form of it or other derivates of it. I must underline I'm not talking about nsibidi and southeastern Nigeria (it has a completely different structure), I'm referring to that Nigerien script and bassa vah. OK. Show your evidence of the ancient origins of Nigerian and Bassa scripts. That would be something interesting to see. I hope the references are reliable, though. The stone monoliths of Alok Ikom bear a form of writing and a complex system of codified information. Although they seem to share the same general features, each stone, like the human finger print, is unique from every other stone in its design and execution. The geometric images on the monoliths suggest that their makers possessed more than a basic knowledge of mathematics, not only because they are geometric, but also because of the obvious implication that there were computations and numbers on the layout of the stones. Bassa script was found to be used from Bassa descendants of both West Indies and Brazil. So I exclude the Latin influence, writiers were not confined only to a specific place. Maybe they were more in contact with dynamic trading regions, and a group of them were influenced. So, why only a little group of speaker of Kru languages knew Vah (it means "to throw a sign")? I think it was characterizing of only that group (Bassa) and tribalism saved it, alternatively it would be disappeared. Liberia now is restoring and the hope is that in the future there will be the possibility to investigate in such questions. I know of Nsibidi and am very interested. The thing I never quite get about Bassa, Vai, Mande, and this Nigerian script that I have never heard of, is if they indeed are ancient, then where indeed are the examples of their use in ancient times? I know that the Greeks wrote because I have read Herodotus. I know that the Romans wrote because I have read Tacitus, Suetonius, etc. I know that the Egyptians wrote because, though they did not do history in the same sense, I have read the Book of the Dead. Where are the interesting works illuminating West African history? It is not that I am saying that it is impossible that these scripts existed, only that I find it perplexing that no one has produced large varieties of work. If inscriptions were on ancient grave sights, could you post them for us? Could you give me some credible links where I can go find them? Bassa script was found to be used from Bassa descendants of both West Indies and Brazil. . Sorry, but that's not evidence of an ancient origins. Slave trade was active in certain places of the West Indies and Brazil up to the end of the 19th century, so the transporting of tradition could have happened in recent times. And that's not what it meant by "ancient". Please, could you show us your evidence of antiquity? Absolutely. I couldn't agree more with you. The classic of Mali, the Sundiata, for instance, was transmitted orally by griots of the region, and was preserved that way during centuries. Now, if writing were widespread in Western Subsaharan Africa why to preserve literature by memorizing? Anyways, let's wait for the evidence, that our expert will certainly provide us. Yes, my job on this thread is over. We covered all the aspects. Could you possibly just clarify which forms of writing you are saying are ancient other than Geez, Meroitic. Tifinagh and Nsibidi. You at one point boldfaced that Bassa might be 500 years old, and then seemed to walk it back. All I want to know is if there is any evidence for this or any of the others being fairly ancient? About Bassa I simply don't know, only further researches will answer the question. If you do find some sort of evidences, please post them. Yes, if Jilgom finds any evidence to his claims... let me know.